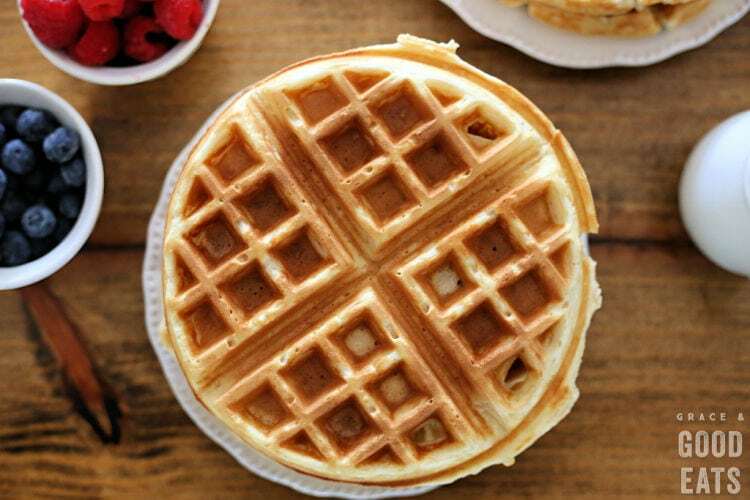 Use this Fluffy Waffle Recipe to make thick, fluffy waffles without the hassle of beating egg whites! 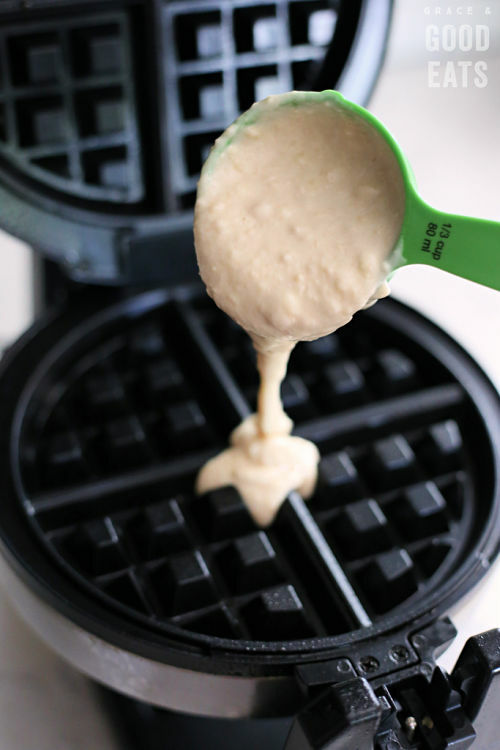 Make a double-batch and freeze for homemade waffles in minutes. I received a waffle maker for Christmas a few years ago but the poor thing has been collecting dust in a cabinet ever since. I love waffles (all.the.breakfast foods, really) but just about every recipe I find calls for separating the eggs and beating the egg whites. And, honestly, that whole process beats me down. 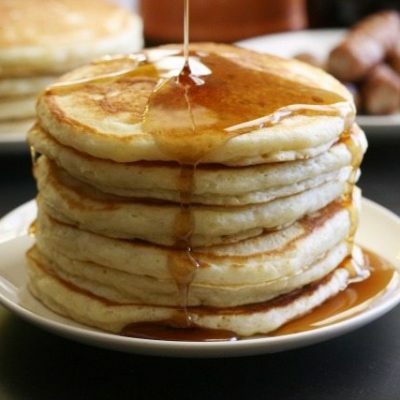 What I love about my Homemade Pancakes is that I don’t have to get out my stand mixer, I always have the ingredients on hand, and they’re so easy that even my two-year-old can help make them. I expect the same from my waffles! Once I realized that was all that was holding me back from golden-brown waffle goodness, I set out to develop a fluffy waffle recipe that wasn’t so cumbersome. 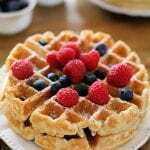 In fact, this Belgian waffle recipe uses the same simple ingredients as my homemade pancake recipe with only a few changes to the amounts. What is a Belgian Waffle? In North America, Belgian waffles are typically made with a lighter batter- traditionally a yeasted batter, though baking powder is often used today. 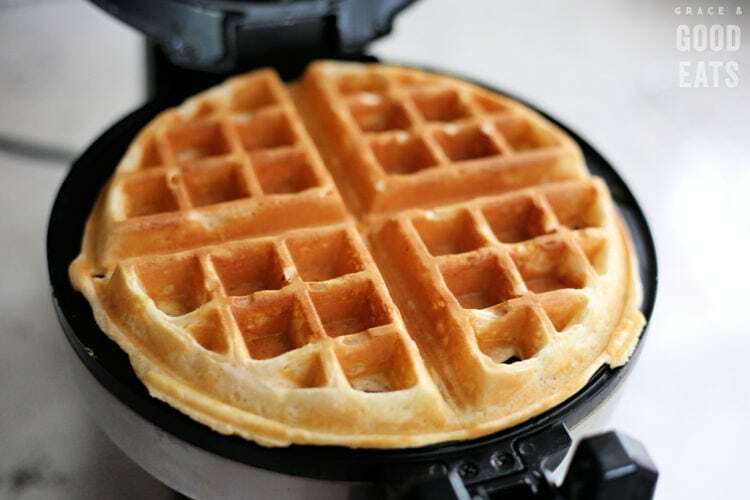 Belgian waffles are also made using a Belgian waffle iron which results in larger squares and deeper pockets than traditional American waffles. 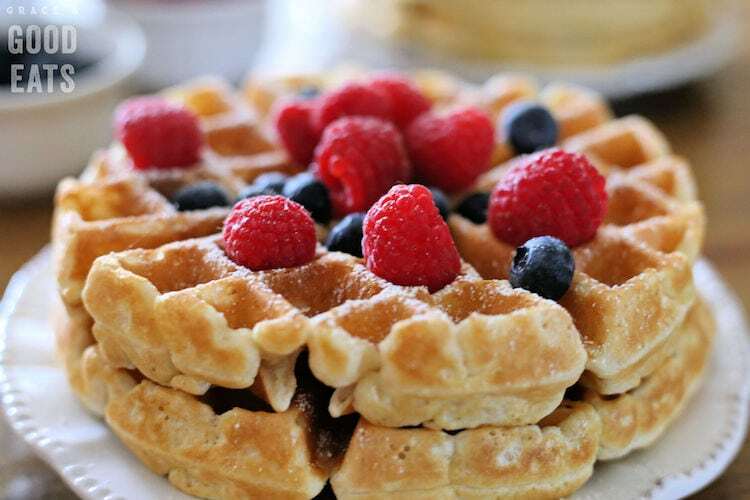 Belgian waffles are not to be confused with the different varieties of waffles found in Belgium, like the Brussels waffle or liege waffle. Honestly, I’ve seen people ask that on other waffle recipes. There’s all kinds of YouTube videos and kitchen “hacks” to help. My question is: can you still call it a waffle if you didn’t use a waffle maker? Most mornings I try to make my kiddos a hot breakfast but sometimes we’re running late and only have time for a bowl of cereal. I try to keep my freezer stocked with a batch of these for emergencies! Waffle emergencies. Totally a thing. To Freeze the Waffles: Freeze the waffles in a single layer until hard (so they don’t stick together), then slip them into an air-tight plastic bag and stash them for several weeks in the freezer. Ours never last that long! To Reheat the Waffles: Remove them from the freezer and pop them into the toaster (a 1/4 section at a time) or into a toaster oven. As you pull the warm waffles off of the waffle maker, don’t stack them as you would pancakes. These waffles will do better when placed on a wire baking rack in a single layer to prevent them from getting soggy. Yes, four teaspoons of baking powder. No, that is not a typo. Use quality baking powder that isn’t expired. If you can’t remember the last time you bought some, it’s probably time to replace it. It will not make the waffles taste metallic, baking powder should not have a taste. It is simply a leavening agent. I used a scant 2/3 cup of batter for each 1″ waffle. This will vary based on the size of your waffle maker. Don’t worry about filling the entire surface, the waffles will puff up some as they bake. You want to shoot for about 3/4 of the griddle surface to be covered. Preheat waffle iron. Gently coat with nonstick baking spray. In a large bowl, combine the flour, sugar, baking powder, and salt. Use the back of a spoon to create a "well" in the center. Whisk the two eggs into the milk until well combined. Serve immediately or lay on a wire cooling rack until cool. Store leftovers in an airtight bag in the freezer. This waffle was light and fluffy and the perfect sweet taste. I used flax seed meal instead of egg and made berry sauce to go with it. Thanks for the recipe. These are yummy and really were fluffy! My 5yr old, 2yr old and husband approve. These are incredible! 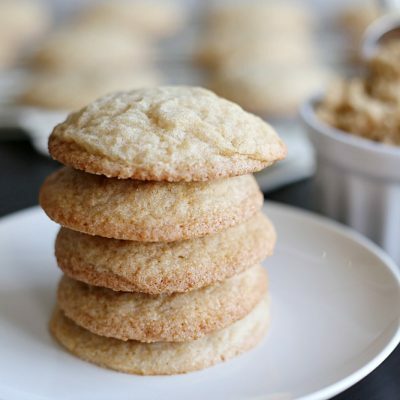 I substituted dairy-free milk and butter and gluten-free flour (and added cinnamon) but I love that I don’t have to separate the eggs and they still come out super light and fluffy! Thank you for sharing. This recipe is my new waffle go-to! Yep, 100% recommend, I may have underestimated the fluff of these waffles whilst cooking which resulted in a minor waffle maker batter explosion. But the finished product is delicious light and… full of fluff! 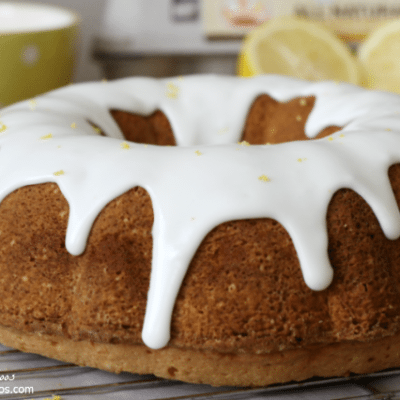 Kudos on an easy recipe worth keeping! My new Cuisinart plane-Jane waffle replaced the one I gave away 20 years ago. My poor kids grew up with junk waffles😟, I didn’t have a clue that pancake mix was not waffle mix. My youngest married and left 20 years ago so, but I’ll make this even if only for grandpa and me. I’m a super novice cook/baker. Sigh…. 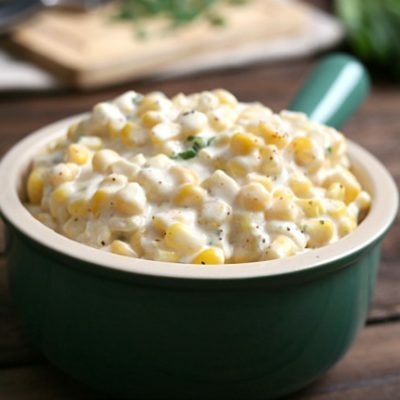 this is a super easy AND TASTY recipe! I think the hardest thing about this recipe is that we now have to justify paying for brunch at a restaurant again! 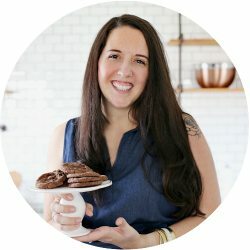 I bake a lot and love to search for new recipes. I made your waffles this morning and they were PERFECT. And I don’t say that lightly….if everyone follows this recipe exactly it will yield fabulous waffles. I used a jumbo egg, and popped some blueberries into the batter and topped them with toasted sliced almonds and a bit of cinnamon sugar and real maple syrup. These will be the only waffles I will make from now on; thank you Emily Grace! OMW! 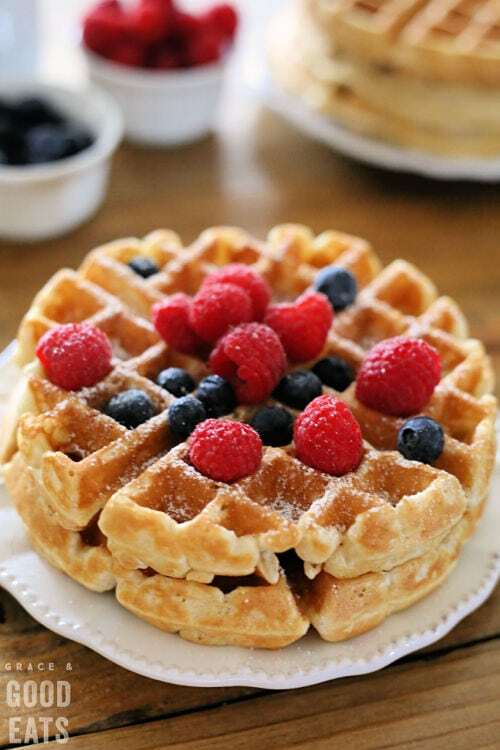 These are truly the BEST waffles ever and are so incredibly easy to make! My family generally drowns waffles & pancakes in syrup (much to my dismay) but THESE…they barely used syrup and I had to make two more batches on the spot to match their appetite!! DELICIOUS!! So happy to hear that, Lynne! Great recipe! I got busy between making the batter and getting them on the iron. The longer this batter sits thie thicker, fluffier and harder to spread it gets so I’m sure this is what others are complaining about, but I wasn’t fussed and just used a spatula to spread it out a little, and they came out beautifully. For my own tastes I ‘d add a wee bit more vanilla next time, and maybe a little sugar, but my kids couldn’t have been happier the way they were unadulterated. I will never understand people who don’t follow a recipe then complain about it (duh, duh, duh). If you follow this exactly and get bad results, you’ve done something wrong because it’s perfect as-is. Thank you for your comment, Heidi 🙂 I’m so glad you enjoyed them! Just wondering could you make the batter the night before and serve it in the morning or does it have to be cooked straight away? Hi Aisling, these really should be cooked after mixing. Once you mix the wet and dry ingredients, it activates the baking powder, and the longer it sits the less fluffy you waffles will be. You could certainly mix up the dry ingredients the night before though so you have less measuring to do the morning of. Hope this helps! Grace, I tried your recipe and it is awesome! I used almond coconut blended milk and it was great! They come out a little lighter in color but are very fluffy and tasty. I will be freezing some as well. Thanks for sharing that you had success with coconut/almond milk! Glad you enjoyed. I just made these waffles today and omgosh they are so good!! 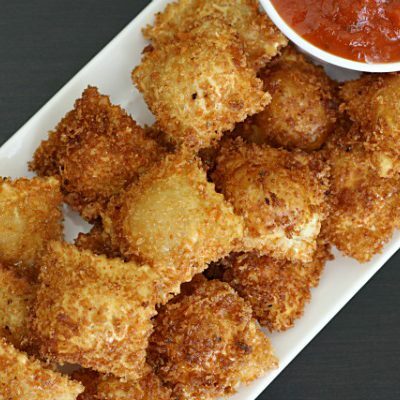 I have tried other recipes that were not soft inside but, these were wonderful!! My boys loved them!! Thank you for a great recipe! Made these this morning at the request of my 11 year old. I followed the recipe, used white wheat flour, and added a bit of cinnamon. The taste was great, but the texture was sort of sandy and crumbly. Everything was fresh, didn’t overmix, any ideas? Sorry, I haven’t had that issue. I use all-purpose flour in this recipe. Made this with my 16 year old son this morning and we loved them! So quick and easy. I didnt have unsalted butter so we only added half of what it called for and they are delicious! Thank you for sharing. I purchased salted butter; will that mess the recipe up? This is a fool-proof recipe! I know because I have tried at least 4 or 5 different waffle recipes now, and this one is hands down the best. 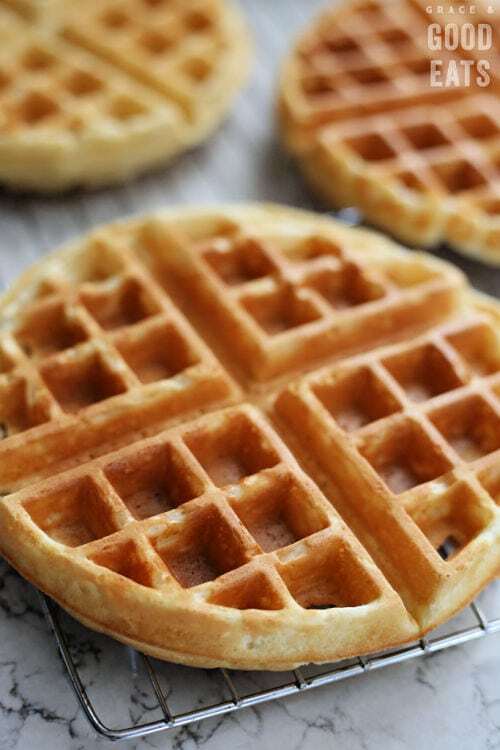 Easy to follow, the waffles came out beautiful and crispy, and had a nice buttery flavor instead of flour which is how these recipes often end up tasting. Delicious, and no changes/additions were made or needed! I am notorious for ruining waffles, tried this recipe bc I was out of box mix and oh-my-lanta, I FINALLY MADE PERFECT WAFFLES!!!!! I followed the recipe and they were perfect, no more box mixes for us! This morning we made these AMAZING waffles in a Belgium waffle maker. We used Bob’s Red Mill Gluten-Free All-Purpose flour as I am recently gluten free. Don’t tell my mom, but these were the best waffles I have ever had in my life. This is a keeper! I haven’t made waffles in YEARS. Wife wanted a waffle maker for Christmas…. still don’t really know WHY she wanted a waffle maker. Seemed so random. So, got the new Calphalon waffle maker and Googled a waffle recipe. You had me at “easy”. So, this morning made this recipe and they came out so well. Daughter and wife loved them. They were crispy and fluffy. I am sold. This will be my go-to recipe for waffles. Next we add blueberries. So happy to hear that, Michael!! Ha! Ha! This was me this xmas! Just made an awesome batch!! Amazing! We just had these for breakfast and they were so delicious! Such an easy recipe! We even had some left over for freezer which is very handy for those times your just craving waffles and can’t be bothered to make them! Made these this morning for Christmas breakfast; the were delicious! I made these as the recipe asked for, but when it got low I added half a yam and a load of pumpkin spice for myself and my boyfriend. It was amazing! My family loved them. They were super fluffy and possibly the most perfect waffles I’ve made. I preferred the spiced ones myself. Yum!! You would love these waffles: https://www.graceandgoodeats.com/sweet-potato-waffles/ the bursts of sugary pecans + the soft pumpkin spice flavor are EVERYTHING! I used this recipe this morning and they turned out quite well. I used whole spelt flour instead of all purpose, so the batter was pretty thin. I’m also at altitude, so I used 3 teaspoons baking powder instead of 4. I did separate the eggs and whisk the whites to a soft peak, but next time I probably won’t do that and I think the waffles will still turn out fluffy. I know the spelt flour had an impact on the texture of the batter in my case, but I wonder if the problem with a too-thick batter for some is just the everyone measures differently; a packed 2 cups of flour is pretty different from a loosely packed measurement. 4 Teaspoons of Baking Soda ? Seemed like a lot. Waffles were not fluffy, instead they were rubbery and had a bitter after taste. Flour, eggs, milk, and vanilla were fresh, although baking soda was old (but cookies baked day before w/ same were fine. Hi Kent, the issue is that you used baking SODA instead of baking POWDER. This recipe calls for baking powder and it does need to be fresh. Hi Michelle, the batter should be thick. No need to add more liquid. Hope this helps. My hubby is picky about waffles. He said these were the best he had ever had! So happy to hear that Connie!! Ran out of waffle/pancake mix. Found this recipe. No need to buy more store-bought mix. This is just as easy. These were a hit with the kids! (Ages 5, 7, 8, and 11 months!) I threw in a couple shakes of cinnamon, and they were delicious! So glad your kiddos enjoyed them, Liz!! My husband loves to add cinnamon to pancakes, I’ll have to try it with these waffles next!